:Now with a new cover! This book offers the inspiring true stories behind 101 of your favorite hymns. It is excellent for devotional reading, sermon illustrations, and bulletin inserts, as well as for historical or biographical research. 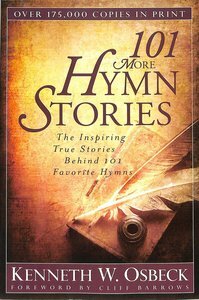 About "101 More Hymn Stories: The Inspiring True Stories Behind 101 Favorite Hymns"